Awards for the best contributions presented at the XVII B-MRS Meeting: list of the winners. Participation of B-MRS young members in international events on sustainable materials. The B-MRS group at the headquarters of the Council of Europe. 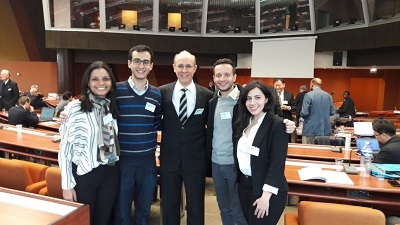 From the left, Gisele Amaral-Labat (B-MRS member), Eduardo Neiva (member), Professor Osvaldo Novais de Oliveira Jr (president of SBPMat), Kassio Zanoni (member) and Parinaz Akhlaghi (member). 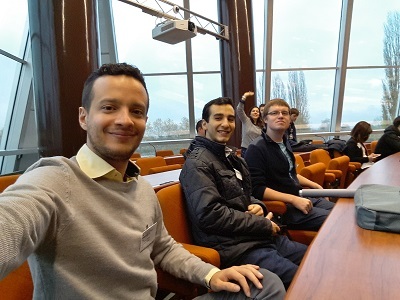 Four members of B-MRS were part of the select group of about 30 young researchers from several countries who participated in two events held in the city of Strasbourg, France, along with 60 other participants. The main subject of both events was material innovation for a sustainable society and a global circular economy (i.e., based on reduction, reuse, recovery and recycling of materials and/or energy). The events were organized by several research societies in materials research, the International Union of Materials Research Societies (IUMRS) and other entities, with the support of UNESCO. Post-doctoral fellows Eduardo Guilherme Cividini Neiva (currently full-time professor at FURB, after completing a post-doc at UFPR), Gisele Amaral-Labat (USP), Kassio Papi Silva Zanoni (IFSC-USP) and Sedeyeh Parinaz Akhlaghi (UNICAMP) were the young B-MRS members who participated in the events. The four postdocs were selected from 20 candidates in the context of the B-MRS Young Researcher Award. They have earned the right to attend the events (which are not open to the public), as well as travel costs. The award was made in partnership with the European Materials Research Society (E-MRS). The first of the events was the “Forum for the Next Generation of Researchers 2017,” held on 18 and 19 November of this year at the headquarters of the European Youth Center. The forum brought together different generations of researchers around science and technology for a sustainable world. The event included lectures by senior scientists, poster presentations of young researchers and discussions among all participants. In addition, all young scientists participated in the preparation of a report that was presented at the end of the event. Then, on the 20th and 21st, the “6th World Materials Summit” was held at the headquarters of the Council of Europe. The subject of innovation in sustainable materials and the circular economy was discussed through lectures by scientists from various countries and round tables. According to Kassio Zanoni, the discussions of the two events showed an academic, political, social and environmental view about themes related to sustainability, as well as the perspectives of Materials research in this context. According to the B-MRS participants, some of the topics addressed were the conversion, storage and distribution of energy (solar, for example); production of more efficient and less polluting batteries; capture and reuse of carbon dioxide; materials recycling; and many other topics. The president of SBPMat, Osvaldo Novais de Oliveira Jr, professor at IFSC-USP, represented SBMat in the international committee of the summit and gave a lecture in the forum about nanomaterials and their applications. Read our interview with the B-MRS young members who attended the events. B-MRS Newsletter: Briefly tell us about the work you presented in the “Forum for the New Generation of Researchers 2017”. Eduardo Neiva: I presented a poster about my postdoctoral work, whose theme involved the application of graphene nanocomposites in the construction of energy storage devices. Gisele Amaral-Labat: My panel discussion consisted of activities that are currently being developed in my postdoctoral fellowship. The work is based on the use of pulp and paper industry waste, crude black liquor, in the synthesis of porous carbon foams in the presence of nickel, for direct ethanol fuel cell applications. The synthesis form used generates a product with a greater amount of residues, besides the low cost when compared to the electrocatalysts used in the current market. Kassio Zanoni: I presented a poster of the work I am developing in the postdocs, on ways and concepts for energy conversion and sustainability. B-MRS Newsletter: How did your participation in these events contribute to your development? Eduardo Neiva: Unlike other events, I had the opportunity to participate in discussions involving topics of global importance. My participation in this event will also result in future international and national partnerships, where in the event, I and the participant Gisele conceived projects to be developed in the near future. Gisele Amaral-Labat: Undoubtedly, participating in these events was extremely important for my academic background, first due to the type of event, in which a common theme is discussed by two different communities, academic and business, enabling me to know different global views of the subject. Secondly, it created the possibility for collaboration with other research centers, including young and senior researchers, national and international. Furthermore, the event allowed getting to know the work of the other young Brazilian researchers, and a possible collaboration with Eduardo Guilherme Cividini Neiva is in progress. The objective is to synthesize sustainable carbon materials for application in the area of energy storage, taking advantage of the expertise of both of us. Kassio Zanoni: The event provided the opportunity for meetings with several researchers, increasing our networks of collaborations. It was very interesting to hear the different views and this brought a great deal of professional growth. It really was very productive, perhaps the most productive meeting I’ve ever attended. 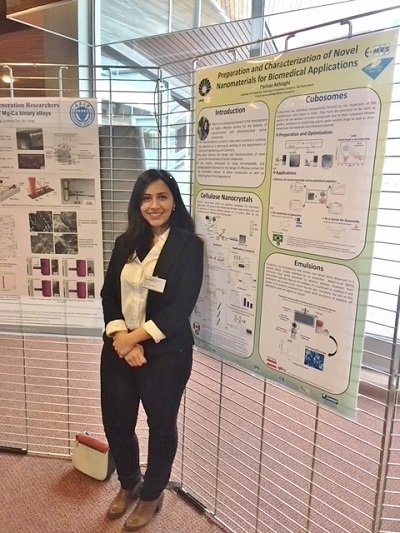 Parinaz Akhlaghi: I believe that my participation in these events was one of the most rewarding and most influential experiences in my career as a researcher and as a human being. I was affected in an extremely positive way by being in the presence of young researchers like myself, as well as experienced scientists, shaping my worldview (and my future), my ambitions and desires in the academic career. Being in the presence of scientists that I have admired for so long and being able to exchange ideas with them was very rewarding in several aspects. All the discussions were profound, passionate and motivating. It was certainly an experience shared by the other young scientists. B-MRS Newsletter: What most attracted your attention in the events? Eduardo Neiva: The direct and prolonged contact with renowned researchers. Gisele Amaral-Labat: I was delighted with how receptive the senior researchers were with the young researchers. Moreover, the event showed a relevant multidisciplinarity of the professionals and the works presented. Kassio Zanoni: The different views on the same theme, which vary widely between different countries. Parinaz Akhlaghi: What at first could have been a barrier, soon proved to be extremely pleasurable. Despite the age difference between the main scientists (some older than 70) and the young researchers (some 25 years old), the exchange of information flowed naturally. On both sides there was passion when talking about science (as a whole), as well as new paths and alternatives for a more hopeful and better future. Kassio Zanoni (foreground) and other young researchers during the 6th World Materials Summit. Parinaz Akhlaghi presenting her work on nanomaterials for biomedical applications during the forum. Eduardo Neiva (left) and Gisele Amaral-Labat (right) receiving the participation certificate. Young Research Award winners announced. B-MRS (Brazilian Materials Research Society) announces the list of winners of “Young Researcher Award” (YRA), an award from the Society bestowed on postdoctoral fellows, this year in partnership with E-MRS (European Materials Research Society). The prize winners: Gisele Amaral-Labat, Seyedeh Parinaz Akhlaghi, Kassio Papi Silva Zanoni and Eduardo Guilherme Cividini Neiva. The prize winners will participate in two invitation-only international events: “Forum for the Next Generation of Researchers 2017” (Strasbourg, France, 18-19 November 2017) and “6th World Materials Summit” (Strasbourg, France, 20-21 November 2017). They will have travel expenses covered. SBPMat is grateful to all the candidates participating and congratulates those selected, wishing them a fruitful participation at the events. The winners were selected from 20 postdocs who submitted their applications by March 31 of this year. The selection of the YRA winners considered the eligibility criteria explained in the edict, the evaluation of the abstracts of the work to be presented in the events and the evaluation of the CV. SBPMat thanks the judging committee, consisting of Professors Christoph Deneke, Iêda Maria Garcia dos Santos and Newton Barbosa. B-MRS newsletter. Year 4, issue 2. English edition. Year 4, issue 2. Young Researcher Award. SBPMat launches an award for postdocs in partnership with E-MRS. Application submission is open. Here. Registration exemption for the E-MRS Meeting. Meet the selected students who will attend the 2017 E-MRS Spring Meeting exempt from registration fee. Here. SBPMat Membership. The discount period for the 2017 annuity is still open. See the reasons and advantages of being a member of SBPMat and how to pay the annuity. Here. Institutional members. Companies and organizations of all types are also welcome to SBPMat’s membership community. Meet the new institutional partners of SBPMat: Altmann and Interprise. Here. Symposia. The list of approved symposia will be on the event’s website soon. Organization. Meet the organizing committee. Here. Exhibitors. The event website shows the 14 companies that have already confirmed their participation. Companies interested in participating in the event with booths and other means of dissemination should contact Alexandre via this e-mail: comercial@sbpmat.org.br. A team of researchers from Unicamp has developed an innovative “formula” to manufacture luminescent perovskite nanocrystals (quantum dots) that can be purified without degradation. With the robust nanocrystals, the team prepared brilliant and efficient LEDs with innovative architecture. The work was reported in a paper published in Advanced Functional Materials. See our news article. We interviewed Aloísio Nelmo Klein, professor at UFSC and one of the architects of Materials research and teaching at that university. With more than 60 patents and a history of interaction with companies, Klein defines himself as a researcher who is convinced that science is one of the main driving forces for a nation’s development. Learn more about this researcher and his background, starting with his childhood in a village of German descendants in Rio Grande do Sul, and see the message he left for the younger audience and readers. See the interview. Two new laboratories of the Federal University of Pelotas are named after former presidents of SBPMat Elson Longo (UNESP, UFSCar) and José Arana Varela (in memoriam). Know more. Technological innovations made in Brazil in steels used in electric motors and transformers improve energy efficiency. Here. Collaboration of LNNano (CNPEM) with alcohol plant generates technology for the transformation of sugarcane bagasse into active coal, which can be used in the purification of water and air. Here. Striving for aerospace applications, a team with Brazilian participation studies what happens with nanotubes during high-speed impacts and improves the material. Pan-American Polymer Science Conference (PanPoly). Guarujá (Brazil). March 22 – 24, 2017. Site. XXXVIII Congresso Brasileiro de Aplicações de Vácuo na Indústria e na Ciência (CBRAVIC) + III Workshop de Tratamento e Modificação de Superfícies (WTMS). São José dos Campos (Brazil). August, 21 – 25, 2017. Facebook. IUMRS-ICAM 2017. Kyoto (Japan). August 27 – Setember 1, 2017. Site. International Conference on Luminescence (ICL-2017). João Pessoa (Brazil). August 27 – September 1, 2017. XVI Encontro da SBPMat/ XVI B-MRS Meeting. Gramado (Brazil). September 10 – 14, 2017. Site. Application submission to the Young Researcher Award for post-docs is open. The application submission for the “2017 Young Researcher Award” is open until March 31. The award, launched by SBPMat, is now in partnership with E-MRS (European Society of Materials Research). Postdoctoral fellows, SBPMat members with paid annuity fees, who defended their doctorates as of 2010 can apply. Up to four postdocs will be selected. The winners will be announced on May 15. The award winners will participate, with lodging expenses paid, in two invitation-only international events: “Forum for the Next Generation of Researchers 2017” (Strasbourg, France, 18-19 November 2017) and “6th World Materials Summit” (Strasbourg, France, 20-21 November 2017). In the Forum for the Next Generation of Researchers, the SBPMat award winners will be part of a select international group of young researchers and will interact with each other and with world-renowned senior scientists. The program includes activities developed by pairs of young researchers from different countries, their poster presentations and talks from senior scientists. More information about the award, in the announcement, is available HERE. Information on how to pay SBPMat’s 2017 annuity and the advantages and reasons to join, HERE. Waiver of E-MRS Meeting registration fee for B-MRS students. Thanks to an agreement between B-MRS (SBPMat) and E-MRS (European Materials Research Society), up to ten (10) students, members of B-MRS, may have their registration fees waived for the Spring Meeting of E-MRS to be held in Strasbourg, from 22 through 26, May, 2017 (http://www.european-mrs.com/meetings/2017-spring-meeting). Participation of B-MRS (SBPMat) at events in China and integration with Asian societies. Banner of one of the events. SBPMat (B-MRS), represented by its president Osvaldo Novais de Oliveira Junior, attended two events held in China in October, organized by Asian materials research societies and also by the European society for materials research. The events were the 5th World Materials Summit on Advanced Materials for Sustainable Society Development and the IUMRS International Conference in Asia. The president of SBPMat was invited by the China Materials Research Society (C-MRS) and the International Union of Materials Research Societies (IUMRS). In addition to attending both events, Osvaldo Novais de Oliveira Junior was part of the international advisory committee at the first event, and Professor Roberto Mendonça Faria, former SBPMat president and second vice president of IUMRS, participated in the international advisory committees of both events. “The Materials research societies in Asia have made great efforts to integrate with each other and with societies from other parts of the world,” states Prof. Novais de Oliveira Junior, highlighting the work of MRS from China, Japan, South Korea and Singapore. “For several years there has been a close relationship between SBPMat and these societies, which will be represented at our next meeting in Gramado from September 10 to 14, 2017”, he added. The summit, held in Rizhao, Shandong Province, from October 18 to 20, was organized by the materials research societies of China (C-MRS), Europe (E-MRS), Korea (MRS-K) and Japan (MRS-J), and also by the Rizhao Science and Technology Association. It is an annual event where scientists, politicians and entrepreneurs are invited by the organization. They come together to present and discuss the subject of advanced materials for the development of a sustainable society, focusing on specific themes in each edition. In 2016, the themes chosen were renewable energies, mainly for motor vehicles, construction materials focusing on sustainability and materials for oceanographic engineering. According to Professor Novais de Oliveira Junior, the most relevant conclusions of the event regarded the need for international collaborative actions, highlighting the distinctive quality of Materials Science and Engineering to solve crucial problems facing humanity, thanks to the integrated, multifaceted approach and the synergy between experiment, theory and computational simulation this discipline is able to offer. Specifically on the themes of the fifth edition of the event, the president of SBPMat stressed the importance of developing more durable, higher capacity and safer batteries, and the need for sea and building materials research investigations. “As a matter of fact, data regarding maintenance costs of large civil works, such as bridges, viaducts and roads, were presented in the summit, which indicate a great demand for advanced materials, not only to reduce costs, but also to guarantee sustainability,” declared the president of SBPMat. He also mentioned the excellent presentations by European experts in regard to the forms of renewable energy sources that can be extracted from the sea. According to the professor, a document with the main conclusions of the event is being prepared by the participants. The second event, October 20 to 24, was held in Qingdao also in Shandong province, about 150 km from Rizhao, organized by C-MRS and the Taiwan Materials Research Society (MRS-T). This even consisted of 4 plenary lectures and 27 symposiums on materials for energy and the environment, advanced structural and functional materials, biological materials, and simulation, modeling and characterization of materials. B-MRS (SBPMat) – E-MRS Agreement: participation support for SBPMat members at E-MRS events. 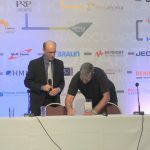 A cooperation agreement signed by B-MRS (SBPMat) and the European Materials Research Society (E-MRS) promotes scientific collaboration between researchers from Brazil and Europe and in particular encourages the participation of SBPMat members at E-MRS events and E-MRS members at SBPMat meetings. 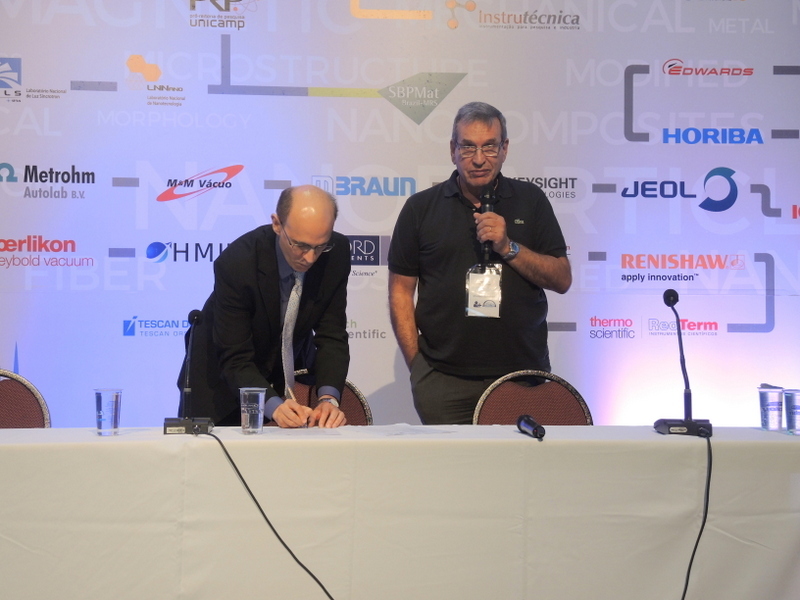 “According to the agreement, SBPMat members can be organizers of symposiums at E-MRS Meeting, a prestigious responsibility for any researcher, and financial incentive will be granted,” explains Professor Osvaldo Novais de Oliveira Junior, president of SBPMat. “Furthermore, students and postdoctoral fellows, members of SBPMat, can compete every year for support to present their work at the E-MRS Meeting in Europe,” he adds. 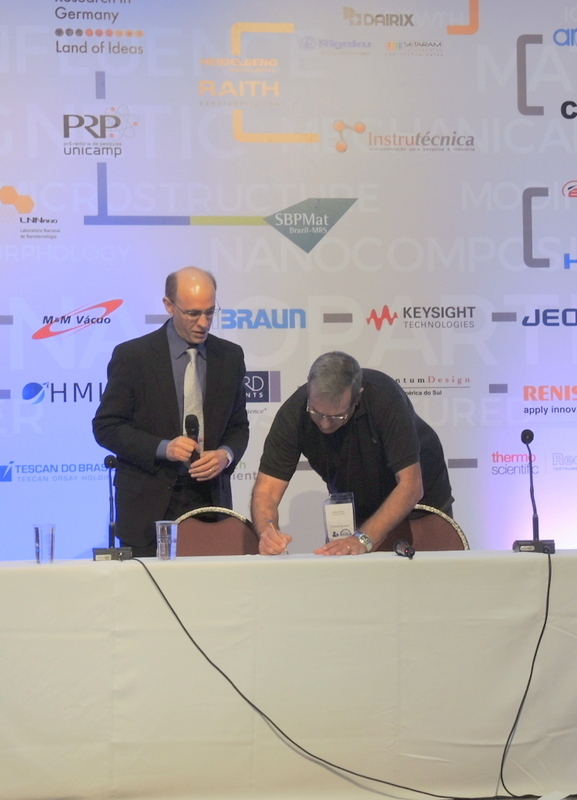 The agreement was signed in Campinas (SP) on October 29, 2016, during the closing ceremony of the XV SBPMat Meeting, by the president of SBPMat and Professor Rodrigo Martins, who represented the European society as a former president. E-MRS Meeting in France: SBPMat organization and Brazilian presence at organic electronics symposium. SBPMat was part of the organization of the E-MRS (European Materials Research Society) Spring Meeting, held from May 26th to 30th, in Lille, France. SBPMat’s President, Roberto Mendonça Faria, full professor at the Institute of Physics of the University of São Paulo (USP) was among the Conference Chairs, jointly with four European scientists. In addition to that, SBPMat has supported one of the event’s 30 symposia, the DD “Functional materials and devices for organic electronics”, which was also assisted by the Brazilian National Institute of Science and Technology in Organic Electronics (INEO). The symposium displayed substantial Brazilian attendance. It was organized by SBPMat’s Financial Director, Professor Marco Cremona (Pontifical Catholic University of Rio de Janeiro, PUC-Rio), by SBPMat´s current Scientific Director Rodrigo Bianchi (Federal University of Ouro Preto, UFOP), and Carlos Graeff (São Paulo State University, UNESP), SBPMat´s former Scientific Director, as well as by a German and an Italian scientists. “The symposium was a success, both regarding the researchers invited – all highly qualified and leaders in their field of expertise – as to the level of results presented in the technical sessions and the subjects approached, all current concerns in the field of organic electronics”, summarized Professor Cremona. “Not only that, but the symposium has contributed to improve the image of Brazil in this field, and to start new collaborations, while still strengthening the ones that already exist”, he adds. Dedicated to the subject of organic electronics, the symposium comprised oral presentations, posters and 23 invited lectures in sessions on organic light-emitting devices, organic transistors, flexible devices, sensors, organic solar cells, bioelectronic devices, graphene and other transparent conductive films. Other sessions approached the relation between nanostructure and function in advanced organic devices, and the modeling, simulation, characterization methods and new horizons for materials and organic devices. “The topics were well balanced among basic and applied researches in the field of organic electronics, including electronic devices and biosensors”, as Professor Bianchi comments. During the four days of the symposium, over 140 studies were presented, by researchers from European Union member countries, Korea, Japan, Brazil, the United States, Russia, Australia, among others. “The presentations in the Symposium DD brought high-impact lectures to E-MRS, with great participation of Brazilian researchers, proving that the country and SBPMat have been working in fields with scientific impact, and in the knowledge frontier”, Bianchi adds. Indeed, Brazil contributed to the symposium with approximately 20 papers, and two invited lectures.